Creating labels for large document folders is a snack on most Dymo Label printers. Creating these labels from a mobile phone is even easier.... and pretty cool. The Dymo MobileLabeler is a BlueTooth-compatible label printer that can be printed to from iOS or Android (phones/tablets), or from a PC or Mac computer via USB. To print from an iOS device (iPhone or iPad) or from an Android device, you simply download the FREE Dymo app, connect to the MobileLabeler via BlueTooth and start printing labels. To print from a PC or Mac, once you've connected the MobileLabeler via USB you will be promoted to install the free Dymo DLS labelling software. Once installed you'll be able to design and print your labels. It's that easy. 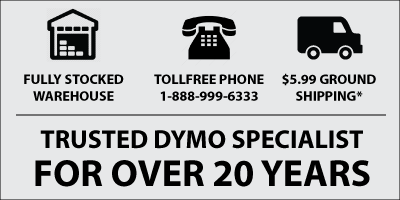 The Dymo MobileLabeler uses the highly popular Dymo D1 label tapes , varying in range from 3/8" (6mm) wide through to 1" (24mm) wide, and available in a wide range of colors, including Red, Greem Blue, Black, White and Yellow. The picture shown on this page is the Dymo 53713 Black on White D1 1" Label Tape. As you can see, the font size that is printable on this label size is very large making it ideal for such large folders.